Pad thai minus the noodles. Zucchini in long strings forms the base of this version. Blend together ingredients for the paste. set aside. 5. Heat a skillet to medium-high (7 or 8). Add olive or sesame oil. Crack your eggs. Mix in some basil, sesame seeds, and salt. beat. pour into hot pan and move around to make a thin layer. Let it set up. it should easily come out of your pan as a thin pancake. 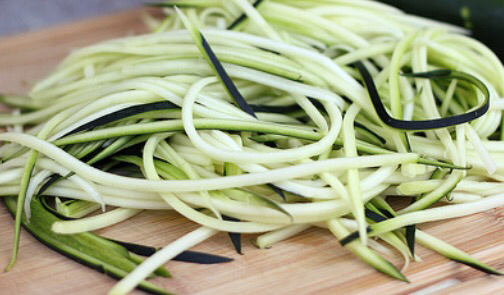 Chop into thin strips and add to your bowl. 6. Mix in your sauce. 7. Set aside or refrigerate to marinate. 8. When ready to serve, top with peanuts, cilantro, basil, and peanuts. toss and enjoy. A lifelong vegetarian. A foodie. Can there be such a thing? Some restauranteurs don't seem to think so...but many of my veggie friends and family have a little something or two to teach them. This entry was posted in garden produce, low carb, main dish, Recipes, vegan, vegetarian and tagged pad thai, zucchini noodles. Bookmark the permalink. * A restaurant we've travelled an hour to get to says they don't have many veggie options...just scallion dumplings. mmm. no. *Realizing that the vegetable item that looks so great on the menu is made with fish stock, beef broth, chicken broth, etc.